JAKARTA– The Ministry of Industry issues Regulation of the Minister of Industry Number 25 of 2018 concerning mandatory application of Indonesian National Standards (SNI) for lubricants. The Regulation is aimed at increasing the competitiveness and utilisation of the domestic lubricant industry. In that way, they can meet the increasing need for lubricants, especially for the national automotive industry. During the inauguration of PT Surveyor Indonesia’s (Persero) lubricant testing laboratory, Industry Minister Airlangga Hartarto said the regulation is also to protect consumers against the negative impact of low-quality lubricant products. The regulation is also to create a healthy business competition between lubricant industries. Minister of Industry explained, related to technical barrier to trade, since ratification of the Agreement Establishing the World Trade Organisation in Law Number 7 of 1994, Indonesia must be able to face the era of globalisation with an atmosphere of intense trade competition. All forms of trade barriers, especially tariff barriers, must gradually be eliminated. “Today only the standardisation mechanism and technical regulations are allowed, and are only used in the framework of protecting human health, safety and security,” Airlangga said in a press statement. In the era of globalisation, many countries use the Standard, Technical Regulation, Conformity Assessment Procedure (STRACAP) as an instrument to secure their domestic industries from imported products. In Indonesia, this instrument is generally carried out through mandatory SNI. The application of compulsory SNI needs the availability of conformity assessment infrastructure, such as Product Certification Institutions (LSPro) and Testing Laboratories. The construction of the Surveyor Indonesia’s testing laboratory is one of the efforts to support the fulfillment of infrastructure needs for the implementation of compulsory SNI for lubricants. 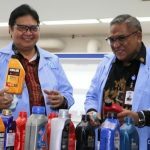 Ministry of Industry hopes that with the establishment of the Surveyor Indonesia’s lubricant test lab, the interest in testing domestic lubricant products can be fulfilled and the domestic lubricating industry will continue to grow. “This lab is the most complete for lubricating tests. So, with this lab, compulsory SNI for lubricants can be tested for all its components. The new lab made an additional investment s some IDR 58 billion,” said Airlangga. It is hoped that through this lab, the utilisation of the domestic lubricant industry will increase. At present, the production capacity is 2 million liters per year. With the presence of this lab, there is no reason not to apply the compulsory lubricant SNI. “The sanctions, those non-SNI lubricants cannot be sold. This lab is an effort to fulfill the infrastructure, and will be able to improve the performance of the industry, especially automotive industry since it is a mainstay of the industrial era 4.0 along with other sectors,” he said. Based on the Ministry of Industry’s records, along with the increasing population growth and production of motorised vehicles, the need for domestic lubricants from year to year is increasing. In 2018, the total production of four-wheeled motor vehicles has exceeded the figure of more than 1.3 million units, while the production of two-wheeled motorised vehicles has reached 7 million units.